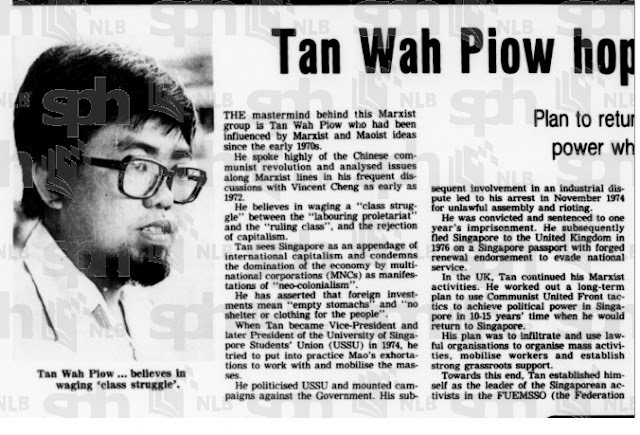 Tan Wah Piow (TWP) made good use of his time in the UK. After securing a place in Bradford University through Malcolm Cladwell, TWP went on to attain his law degree in Oxford University. According to those who have met him, he runs a successful law practice. TWP married Chew Beng Lan, who went into exile with him after he was released from prison in 1975. They have a son. 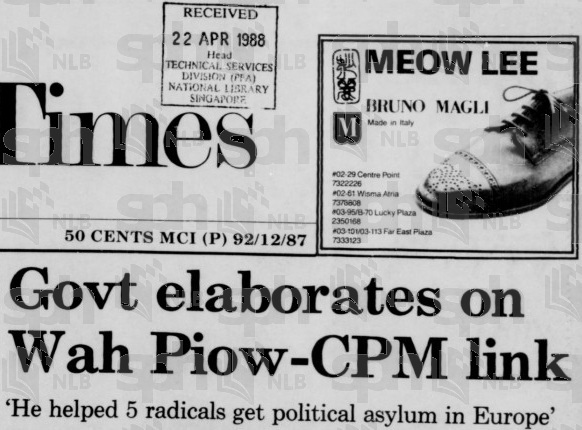 But according to reports released in April 1988, besides engaging in normal everyday activties, TWP was crucial in securing political asylum for 5 members of Communist Party of Malaya (CPM) in Europe. This was made known shortly after the re-arrests of 8 persons who had released a statement to deny charges of the Marxist plot. 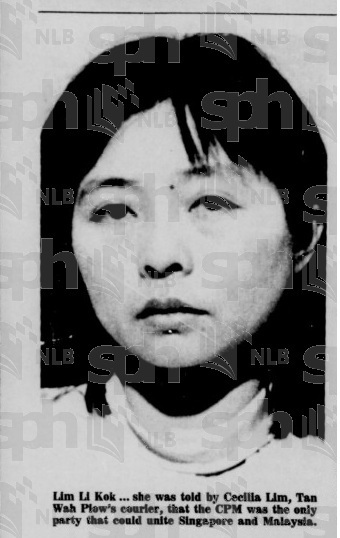 Disclosed by a 1987 detainee Teresa Lim Li Kok, government stated "operational reasons" for not releasing this information earlier in 1987. All 5 members joined the Voice of Malayan Revolution (VMR), a CPM radio service that was broadcasting from South China. 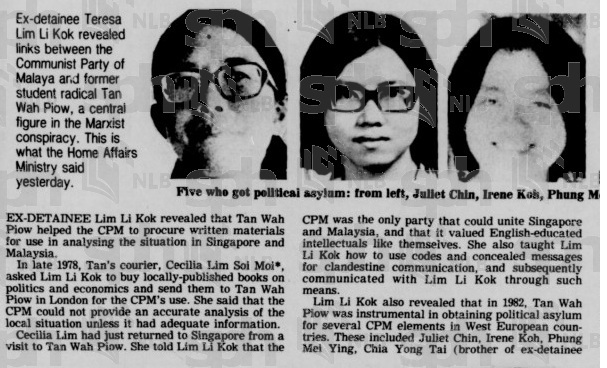 All 5 of them were also closely involved with TWP in the University Singapore Student Union and three of them, Juliet Chin, Chia Yong Tai and Choo Foo Yong, were expelled from the university in December 1974 for radical activities. 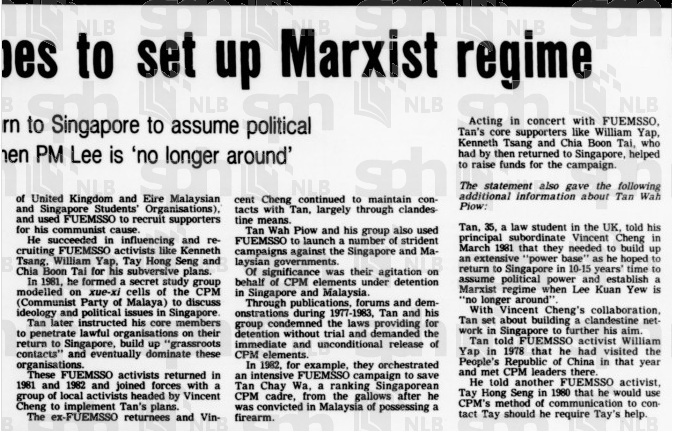 Chia's brother, Chia Boon Tai, and Chin's sister, Jenny Chin, were among those arrested in the 1987 Marxist plot. 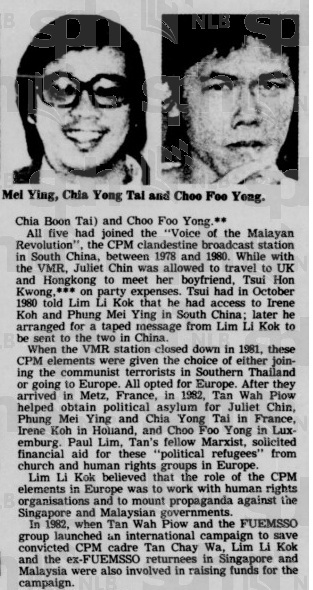 When the VMR closed down in 1981, the option was given to the 5 to join their CPM comrades in Southern Thailand (where many still reside today) or seek asylum in Europe. All 5 choose to go to Europe. After they arrived in Metz, France, TWP helped obtain political asylum for Juliet Chin, Phung Mei Yin and Chia Yong Tai in France, Irene Koh in Holland and Choo Foo Yong in Luxemburg. Teresa Lim said that the role of asylum seekers in Europe was to work with human rights organisations and mount media campaigns against the governments of Singapore and Malaysia. 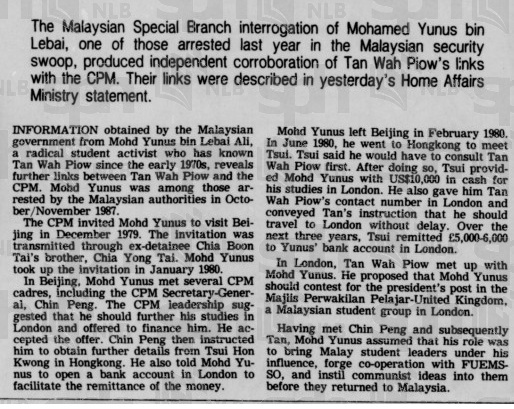 A Malaysian ISA detainee, Mohamed Yunus bin Lebai also met up with TWP in the UK where the latter supposedly urged him to contest for the presidency of Majiis Perwakilan Pelajar-United Kingdom, a Malaysian student group in London. Yunus and TWP had known each other since the early 1970s. Earlier, Yunus was invited to Beijing and was there to meet CPM Secretary-General Chin Peng in January 1980. CPM suggested that he furthered his studies in London and that they would fund him. Through the help of Tsui Hon Kwong who was in Hong Kong, Yunus opened a London bank account and received more than $10,000. 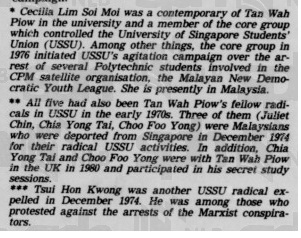 Tsui was expelled from University Singapore together with Juliet Chin et al in December 1974 for student militancy. Tsui and Chin were a couple. He returned to Hong Kong after his explusion although they were known to have met up in Hong Kong when Chin was based in China with the VMR. Read more here. Tan Chay Wa, a senior official of the Malayan National Liberation Front (MNLF) was sentenced to death in Malaysia for possession of a pistol and 7 bullets. He was to be hang in January 1983. A resident of Singapore, he had absconded a 1976 dragnet on MNLF where documents, arms and explosives were sized. During 1968-1974, MNLF had planted booby trap bombs in public areas and secured logistical supplies for Malayan National Liberation Army which was fighting in northern Malaysia and southern Thailand. TWP had known Tan Chay Wa since the early 1970s although it was unconfirmed if TWP was a member of MNLF. 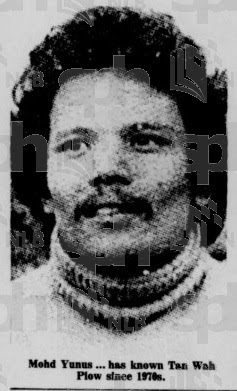 Year 1982, in the UK, TWP and the Federation of United Kingdom Eire/Malaysia/Singapore Students Organisations (Fuemsso) launched a campaign to save Tan Chay Wa from the gallows. 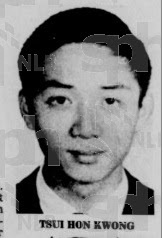 In his early years in the UK, TWP established himself as the leader of Fuemsso, an organisation that had many Singaporean activists such that he could recruit supporters for his cause. Among those that were said to be recruited by him and later arrested for their Marxist activities were Kenneth Tsang, William Yap, Tay Hong Seng and Chia Boon Tai. During the late 70s and early 80s, Fuemsso campaigned through publications, forums and demonstrations for the release of CPM members detained under the ISA and the abolishment of the ISA. These Fuemsso activists returned between 1981 and 1982 to join a group of local activists headed by Vincent Cheng. Cool stuff! Btw, what is 'student militancy'? what did Tan Wah Piow do in Singapore to be deported? All those names are unfamiliar. What did they do??? It's all question marks now. Are there good historical sources to read up all these?? Has anyone here ever wondered what would have happened if the Germans and Japanese won the WWII? To the common layperson, we would then be speaking Japanese instead of Chinese or English. If LKY did not arrest (albeit making use of ISA) these people, and these people became successful in overturning the LKY party, then what? We will be served (or serving) a different team or party, but the results could still be more or less the same. Singapore would be successful because of the hardworking people and the strategic geographical location. My point is rather simple. Singaporeans from 1950s to 1990s, and even up to now, are a generally docile and even unintelligent lot. Thanks to social upbringing or education system, we are not clever enough to step out and take charge of our lives. We have only ourselves to blame, even if the PAP does us in. Tan Wah Piow skipped town to escape NS. They protest and make a lot noise lor. Last time no Hong Lim Park. During the 70s and 80s, many of these neo-leftist groups. A good film recently from Germany was the Baader Meinhof Complex, it was nominated for Best Foreign Film at the Oscars. Can buy a copy of this about the Voice of Malayan Revolution but quite expensive as with this type of scholar books. University Singapore leftists are mostly quite mild compared to those from Chinese medium schools. The likes of Tan Wah Piow and Juliet Chin are probably the last of real student activists who dared to take action against authorities, protests, demonstrations, sit-ins and boycotts. If leftists did not keep foreign capitalism in check, Singapore would have been taken over by American and British companies all over again like in colonial times. thanks for all the work. i might not agree with the newspapers but at least i learn something. waiting for new post by blogger. Is the current SDP Chairman Vincent Cheng the same Vincent you are talking about?